Let's start a one person business, RocketScience LLC. 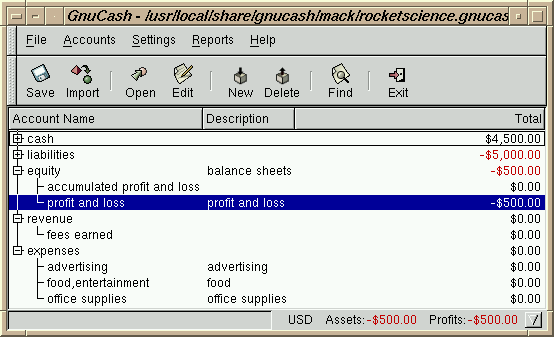 Here's the gnucash screen for the moment the business springs into life. 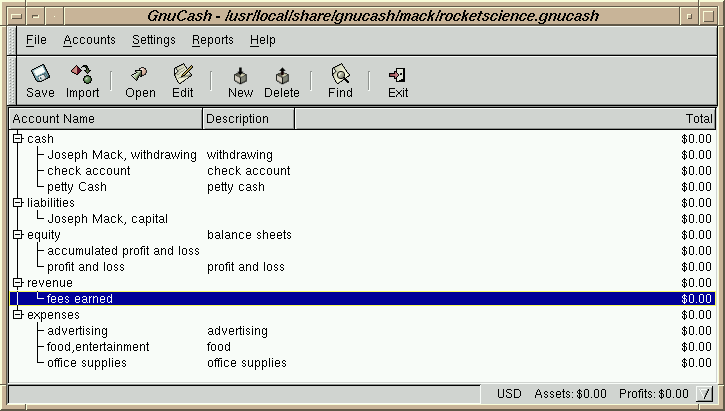 The gnucash screen comes up blank and I've primed the rocketscience.gnucash file with a minimal set of accounts. The blue line is the account which you last accessed. Note: I have grouped accounts of the same type into their own tree. Gnucash allows you to have accounts in trees like this or to have accounts branching directly from the root. The accounts in the same tree must be of the same type. I found it easier to have accounts of the same type in their own tree. All the expense accounts live in one tree. All the cash accounts live in another. I could have had 2 (or more) cash trees (say) if I wanted. 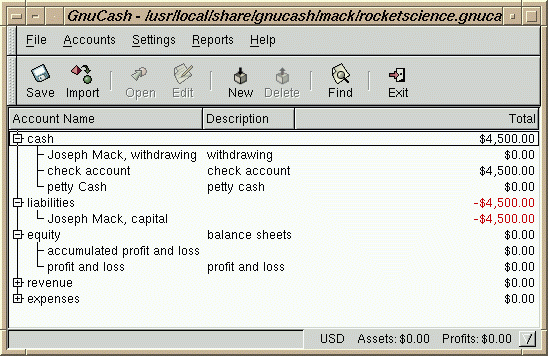 Gnucash recognises about 12 types of accounts. I'll talk more what a "type" is later. The business needs some capital to buy things, so that you can start work. Since you are the owner, let's assume you're going to put $5000 of your personal money into the business. It's going into the business's check account, which one of the cash accounts (the cash.check account). Here's the cash.check account screen as I'm part way through recording the entry. I record that I deposited check #1234 from my personal check account #9876541 for $5000 into the business's check account. Remember that money only moves around, it didn't just appear. It had to come from somewhere. When I record the deposit, I also record (in the transfer column) where the money came from. Since the owner Joseph Mack put $5000 into the business, the business now owes $5000 to Joseph Mack. This $5000 is called a liability. I record that the money in the business's check account came from the account liabilities. "Joseph Mack", capital. A pull-down menu in the transfer box allows you to select the "liabilities"Joseph Mack", capital account as the matching account, completing the entry. Here's the same entry as seen in the matching liabilities.capital account. Note I didn't make the entry seen here. gnucash did it automatically, when I selected the liabilities.capital account in the transfer column, in the screen above. Note that the entry is identical (comments, date, amount of money) except that the money in in the right (credit) side this time. If you read in the newspapers that a company is running a lot of red ink, it means they have a too many liabilities and they're in financial trouble. Companies (at least in newspapers) are "in the black" or "in the red". A black balance in an account means you have an asset, a red balance means you have a liability. In the transaction above, a matching pair of entries creates an account with a black balance (the check account) and another account (the liability account) with an equal red balance. Remember money is not created or destroyed, it's just moved around. We started with 2 accounts at $0 and moved $5000 from one account to another. The target account wound up with (black) $5000 and the source account with (red) $5000. It's the same principle as the creation of matter at the big bang, where in an instant you had the creation of equal amounts of matter and anti-matter. Accountants have been doing the same thing with money for 600 years. Why is the balance in the liability account red? Isn't a liability already negative and therefore a red liability positive? Accountants presumably could have chosen to do it this way, but instead they chose to make liabilities in all accounts red. That way the accountant doesn't have to flip to somewhere else and find out the account type and risk making a mistake. While a balance can be black or red, the entries in the debit and credit columns are always black. The numbers in the debit and credit columns are the amount of money that was transferred in the transaction and this is always positive. The effect on the balance can be in the red or black direction depending on whether the entry was a debit or credit. Liabilities are not neccessarily bad. RocketScience LLC required a liability (to the owner) before it could start business. Banks have liabilities to the people who make deposits. Planned liabilities, which you can cover in the period in which they come due, are a normal part of business. The "red ink" problem are unplanned liabilities or unplanned shortages of cash which don't allow the company to meet its financial obligations as they become due. There always is a debit and a credit column in an account (seen in the liability account above). The words "debit" and "credit" are an arbitrary pair of words, like positive/negative, male/female, left/right. Because of double entry accounting, every debit is matched by an equal sized credit. Both debits and credits are good. Normal citizens like you and me may think that credits are good and debits are bad. This is because when you get a copy of your bank statement, and you see a credit amount and you are happy. It turns out, you aren't getting a record of the amount of money you have (although you may think it is). What they send you is a copy of one of their accounts which shows their financial situation i.e. a liability to you. A credit entry then means that that they have to be prepared to pay you money. You are seeing the bank's view of their financial situation, not your view of your situation. If you were using double entry accounting on your personal finances and had walked into the bank with a pocket full of money, you would have debited the money to your personal petty cash account to match the credit in their account. A credit in the bank's account which is showing their view of their business with you, just means that they have a liability to you for a certain amount of money, and that you are one of their creditors. The statement doesn't say that you have money. In fact you don't have the money at all, they do. If they go bankrupt, no-one has the money. A credit doesn't mean that you have money and a debit doesn't either. It's the balance that is important. Accountants know which is the debit and credit part of a transaction. They spend years learning this stuff. If you ask them, they'll tell you that the credit is the right hand column and the debit is the left hand column. That's the beginning and end of it. However for weenies like you and me there is no hope of remembering whether the action you're taking on an account is debiting or crediting and you'll get it wrong half the time. To help you recognise whether you're crediting or debiting, gnucash gives a name to the credit and debit column that is more in line with non-accountant's perception of the transaction. In the check account, when you put money into it, you put the money into the "Receive" (i.e. debit) column and gnucash will make the corresponding credit entry for you in the liability account. All accounts of a particular type (e.g. cash, liability, expense) have the same names in their debit and credit columns (e.g. all cash accounts have "Receive" and "Spend", all expense accounts have "Expense" and "Rebate"). The transactions that most of us think about are between accounts of different types. The account types is the nearest thing to an orthogonal set that I can see in accounting. I don't know whether there is a finite number of account types, or whether the number has changed since double entry accounting was invented. We're ready to start business. RocketScience LLC wants to tout its unique skill set to the world to earn some revenue and decides to spend some money on advertising. The tax people require you to track your advertising expenses separately from all other expenses, so you set up an expense.advertising account. RocketScience LLC spends $1000 on a webpage with the latest in java applet technology. You write a check on the RocketScience LLC bank account and send it to WebSite-R-US. Here's the entry in expenses.advertising. I'm selecting the matching entry from from the cash.check account (you record your check number, #1001, the first written on your bank account). 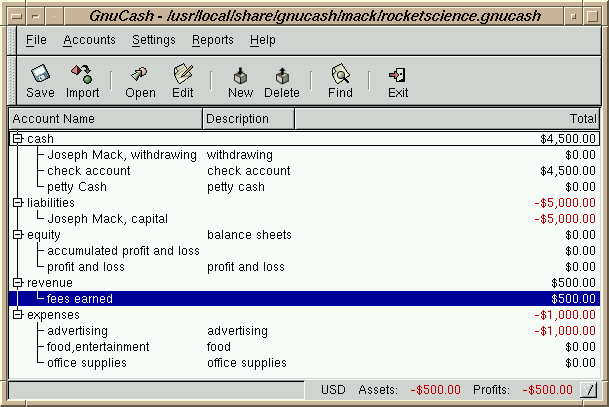 Note that a debit for an expense account in Gnucash speak is the familiar term "Expense". Here's the main screen after recording the advertising expense. The amount of cash has decreased $1000. Nothing surprising here. We didn't really need double entry accounting to see this. We've only had 2 transactions. That afternoon, FastTrack Inc has seen our website and gives you $500 of work, which you do the same day. The customer comes over to say hello and check you out. He's fine with the work, which he picks up. He leaves a check, which you deposit in the bank the same day. 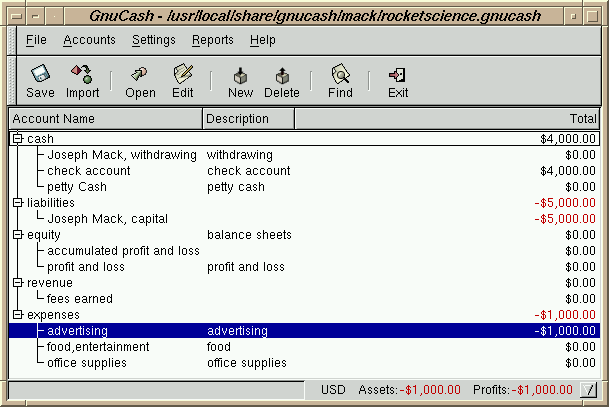 For this you record Income (gnucash speak for credit) in the revenue.fees_earned account, recording their check number. The matching account is your cash.check account, which gets debited. Here's the main screen after recording the revenue. Note that since you earned money, the matching principle of double entry accounting increased the blackness of both accounts by $500. The revenue account was raised from $0 to $500. The cash account, was raised from $4000 to $4500. Now wait a minute. Did I say that? When I was putting money into the bank to start off the business, I said the same thing: I credited one account and debited another. That time instead of both going more "in the black", one account went red and the other went black. This is why there are different types of accounts. Some accounts become more black when they are debited (e.g. cash, liabilities) and some become more red (e.g. expenses, revenue). This is what double entry accounting has over single entry accounting. In single entry accounting you are only concerned with whether you have more money or less (black and red). With double entry accounting you are concerned whether an entry is a debit or a credit. The system handles the black or red part without any intervention on your part. (This is why accounting is smarter than calculus). Lets fast forward to the end of the accounting period (say to 30 Sep) and lets say you do no more business till then. At that time you determine the profit and loss. For this you fold the revenue and expense accounts into a profit and loss account. This process is known as closing out the accounts. An accountant can look at the balance in an account and will know whether a credit or debit is needed to close out the account. I don't know these things. Instead since the number of transactions in the accounts are small (here 1), you can enter a debit or credit for the value of the balance which zeroes out the account. Here's the profit and loss account after closing out revenue and expenses. Profit and loss has a balance that is $500 in the red. This is no big deal, you already knew you'd made a $500 loss. A loss here is not problem in the beginning as long as you have enough capital to pay the financial obligations as they come due (e.g. Amazon.com). Here's the mainscreen after closing out the revenue and expense accounts (the balances in expenses and in revenue are all $0). Profit and loss has a liability (red) of $500. The owner of a business doesn't get a salary. The owner gets money through an increase in his equity. When the equity has increased sufficiently he can withdraw some of it for his own use. The owner also cops any loss. So profit and loss are fine and dandy, but what the owner is really interested in is his equity. Let's see if we can calculate the owner's equity at the end of the accounting period without using double entry accounting. You've put in $5000 initially. On top of that you made a loss of $500 (revenue $500 - expenses $1000). Using single entry accounting you ask the question "how much are you in the hole now?" (stop for a second here to get an answer). To get the new owner's equity you keep some (or all) of the profit within the company to help finance activities for the next accounting period. You close out the rest into the owner's equity. In this case a loss was made and the owner gets the whole loss. Here's the profit and loss account after closing it out into the owner's equity. Here's the mainscreen after closing out the profit and loss account into the owner's equity. The amount of cash in the bank is reasonable. The business started with $5000 and lost $500, leaving $4500. Why isn't the owner's involvement in the business now $5500? After all it was initially $5000 and the business then lost a further $500. The owner is going to have to work harder to recover the extra $500. When I was setting this up, I made lots of mistakes. Is this another of my mistakes? (pause to think here). The problem turns out to be that the question "how much am I in the hole?" is badly posed. Here are the questions accountants can answer. What obligation/liability does the business now have to the owner? The business had an obligation of $5000 and lost $500. It only has $4500 to give back to the owner. This is the same question as "how much is the business worth or how much would the owner recover today, if the receivers came in and liquidated it?" (You can't get blood out of a stone, the business only has $4500 in assets.) If instead, the business looses the whole $5000, there's nothing the owner can recover. This is the only question about the the owner's equity that's of interest to an accountant looking at the business's books. The business is only interested in what it owes the owner and that's all that is of interest to an accountant. How much money has the owner invested in the business? He has a cancelled check from the bank proving it. How much profit would the business need to make, for the owner to recoup his $5,000 investment? This is the answer I expected when I asked "how much are you in the hole now?". This amount may be of interest to the owner, but it doesn't show up in the business's accounts. What's wrong with the original statement "you put in $5000 and then you lost $500"? The problem is that there are two different "you"s in that statement. The first "you" is the owner and the other "you" is the business. The mix-up comes about because the owner identifies with his business. The owner invested $5000 and the business lost $500. The two transactions affect the owner's equity in opposite directions. As a technical person I always find it amazing or amusing that people can happily sit in front of a TV without knowing or even wanting to know how it works. I'm quite proud of my technical knowledge. After finding that the answer in the previous section was $4500 rather than $5500, I realised that in the accounting world I was in the same position as the people who sit infront of a TV set and think there's a little band playing inside it.